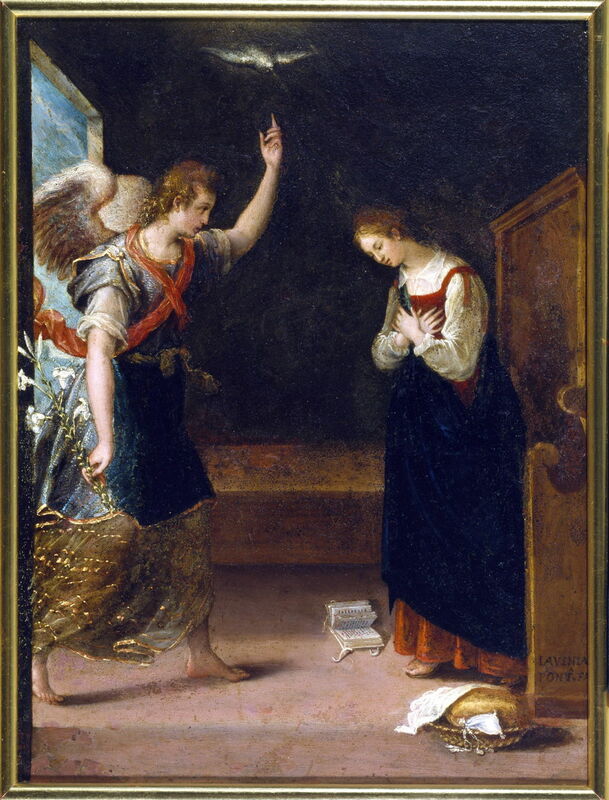 The Annunciation, the announcement by the angel Gabriel to the Virgin Mary of her role as the mother of Jesus Christ, is one of the key events in the life of Christ as told in the New Testament. It has therefore been a major theme in the Western canon of painting. In the Christian calendar, it is traditionally timed as being nine months before Christmas Day, placing it on 25 March, known in England as Lady Day and embodied in many secular calendars even down to the Tax Year (which starts on 6 April, being Lady Day adjusted for the days lost due to calendar change). 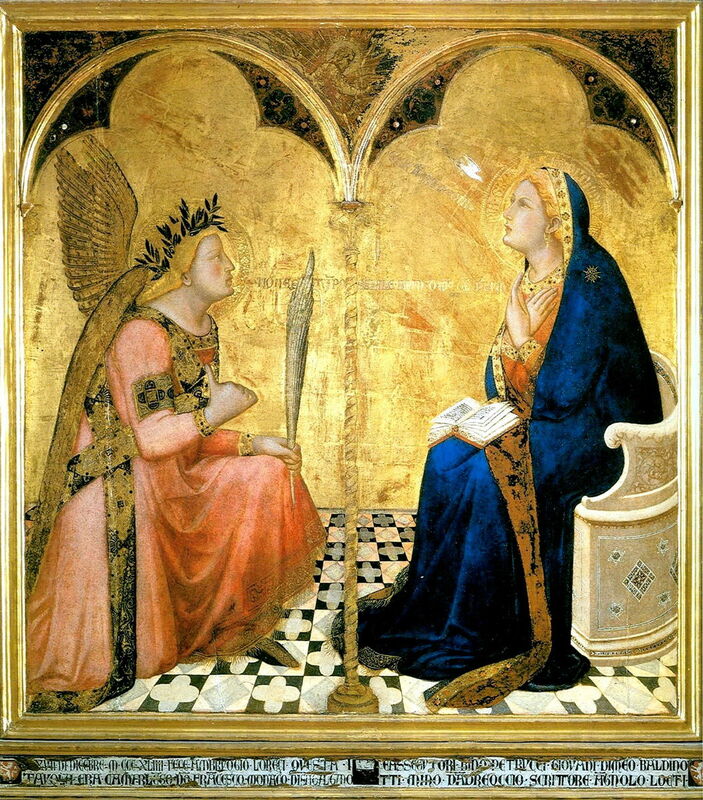 However, I thought it might be useful to look at a broad range of paintings of the Annunciation just prior to those of the Nativity itself, which I will show tomorrow. Ambrogio Lorenzetti (1285–1348), The Annunciation (1344), tempera and gold on panel, 127 × 120 cm, Pinacoteca Nazionale, Siena. Wikimedia Commons. Lorenzetti’s Annunciation of 1344 is his last known work, and is considered by many to have been the first painting made using an accurate linear perspective projection. That is based on the apparently correct projection of its floor. Unfortunately closer examination of the projection used for other passages, such as the chair on which Mary sits, shows that it has multiple vanishing points. But it does come tantalisingly close. It is also complete in its inclusion of the key elements of an Annunciation: the Virgin Mary wears blue, assumes a pious posture with her hands crossed on her chest, and has a book open on her lap. Gabriel wears a contrasting colour, and bears a symbolic token, although here not the usual white lily for purity and chastity. Flying behind them is the white dove of the Holy Spirit, and above that is God in Heaven. 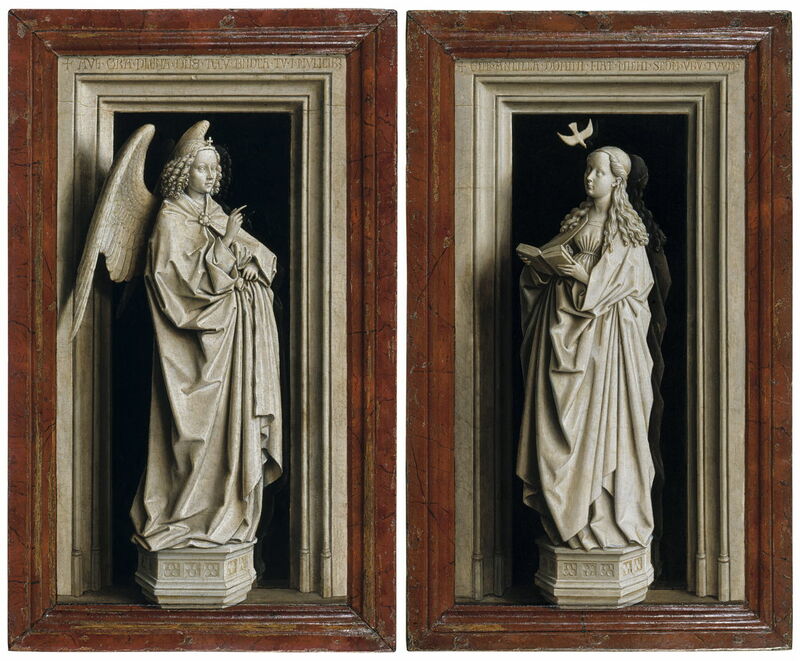 Jan van Eyck’s The Annunciation Diptych (c 1433-35) is a highly innovative trompe l’oeil which pretends to be a pair of sculpture figures in stone and wood frames. This may have started from the concept of a monochrome grisaille, and ended up as vividly 3D as any sculpture. Its inclusion of key elements is, though, conventional. Hans Memling (c 1433–1494), Advent and Triumph of Christ (1480), oil on oak, 81.3 × 189.2 cm, Alte Pinakothek, Munich. Wikimedia Commons. In the late fifteenth century, Hans Memling painted a couple of extraordinary composite narrative works, in which many of the events of Christ’s life were shown in a single image. His Advent and Triumph of Christ is the later of the two surviving works, made in 1480. This shows twenty-five scenes from the whole life of Christ, starting with the Annunciation at the upper left, and the Nativity below it. It then omits the crucifixion itself, ending with the Assumption of Mary at the lower right. 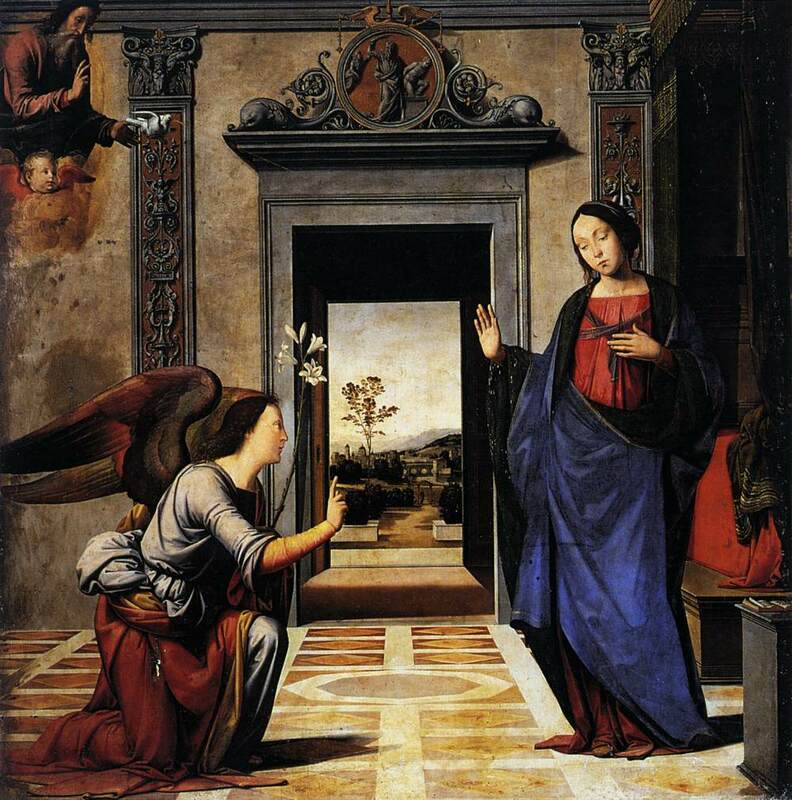 Fra Bartolomeo (1472–1517), The Annunciation (1497), oil on panel, 176 x 170 cm, Duomo di Santa Maria Assunta, Volterra, Italy. Wikimedia Commons. After these early innovations, a traditional pattern emerged, shown in Fra Bartolomeo’s early version of The Annunciation from 1497. Gabriel holds a white lily now, and there is a cameo landscape visible through the open doors. As with Lorenzetti 150 years earlier, the young painter has a bit of a struggle with his perspective projection. As shown in the floor patterning and the doorways, it does not resolve to a single vanishing point. Lavinia Fontana (1552–1614), The Annunciation (c 1575), oil on copper, 36 x 27 cm, Walters Art Museum, Baltimore, MD. Courtesy of Walters Art Museum. Lavinia Fontana also took on the challenge of The Annunciation early in her career, here in about 1575. Working in oil on copper, her painting is wonderful for its very naturalistic figures, while remaining complete in its key details. 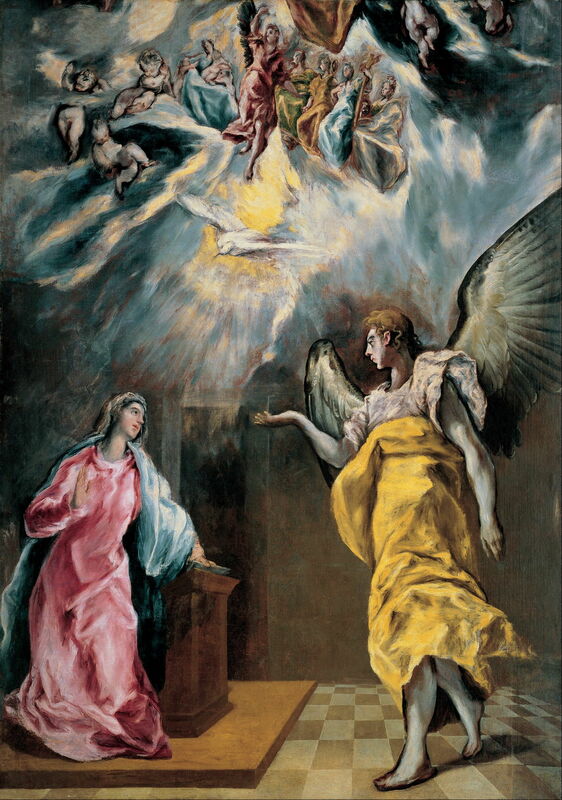 El Greco (Doménikos Theotokópoulos) (1541–1614), The Annunciation (1614), oil on canvas, 294 x 209 cm, Fundación Banco Santander, Madrid. Wikimedia Commons. El Greco’s Annunciation (1614) is another unconventional composition, its figures placed in more expressive poses, with eloquent body language. The white dove is flying from a gaping light in the heavens, with a host of mothers and babies above. 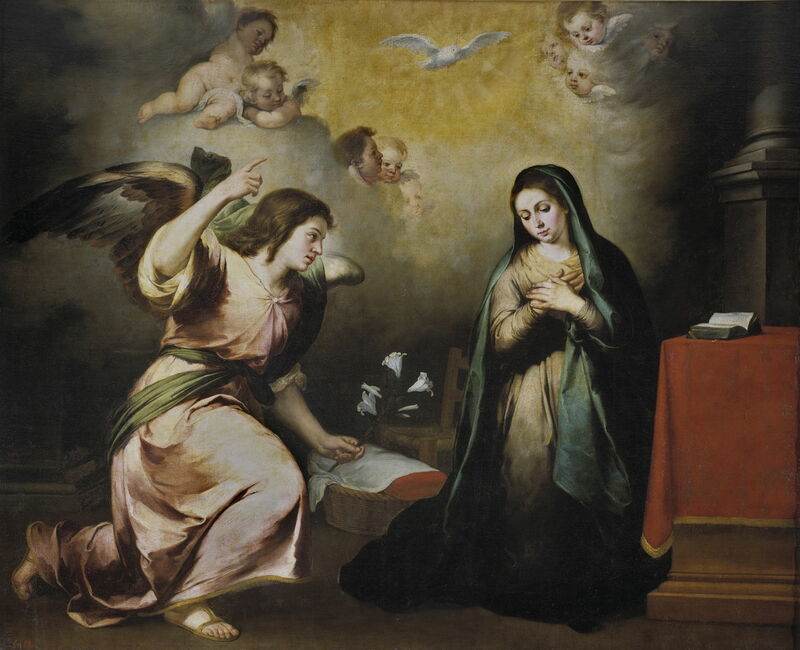 Thirty-five years later, also in Spain, Murillo adopted a more traditional approach in The Annunciation (c 1650). As with Lavinia Fontana and Fra Bartolomeo before, this was painted quite early in his career. His inclusion of nine winged putti and a small wicker crib in the background strengthen its theme of maternity, and help empathy and identification by viewers. Adriaen van de Velde (1636–1672), The Annunciation (1667), oil on canvas, 128 x 176 cm, Rijksmuseum Amsterdam, Amsterdam. Wikimedia Commons. Some quite unlikely painters have produced fine Annunciations too. 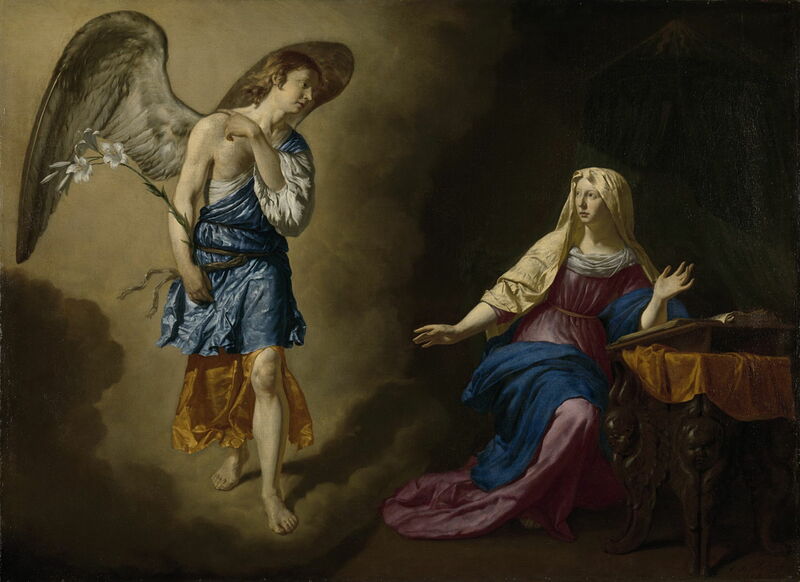 Adriaen van de Velde, known best for his animal paintings and landscapes, converted to Catholicism to marry into the Catholic church, and then painted The Annunciation in 1667. For what must have been his first major figurative painting, and on a large canvas, the work is superb. Gabriel looks slightly awkward in parts, and he has omitted the white dove, though. 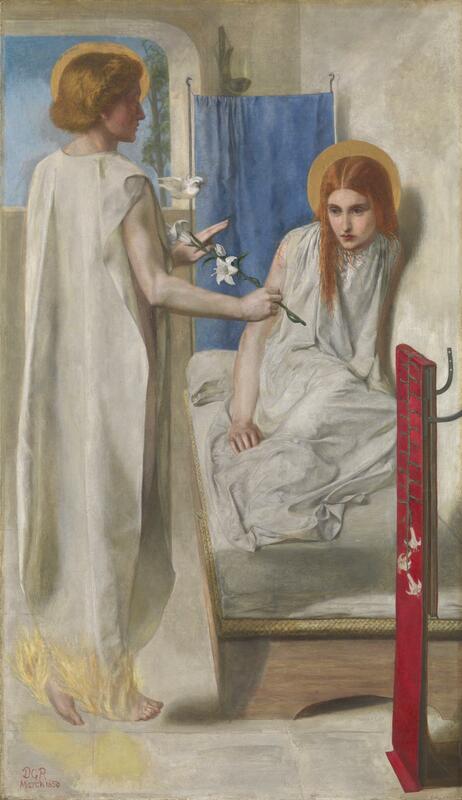 Another surprising painter of such a traditional set-piece is the Pre-Raphaelite Dante Gabriel Rossetti. He departs from convention throughout, using a title from the Vulgate text of Ecce Ancilla Domini! (1849–50). 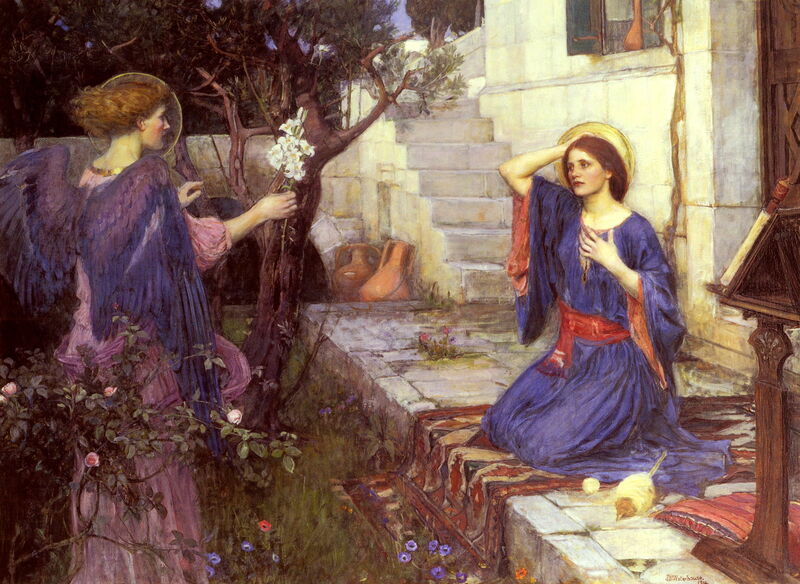 In accordance with his early Pre-Raphaelite style, it combines great naturalism in its figures with deeply traditional plate-like gilt halos, and extends the catalogue of symbols to include white robes for purity, red embroidery for Christ’s crucifixion, a blue curtain for heaven, and flames at the feet of Gabriel rather than angel’s wings. 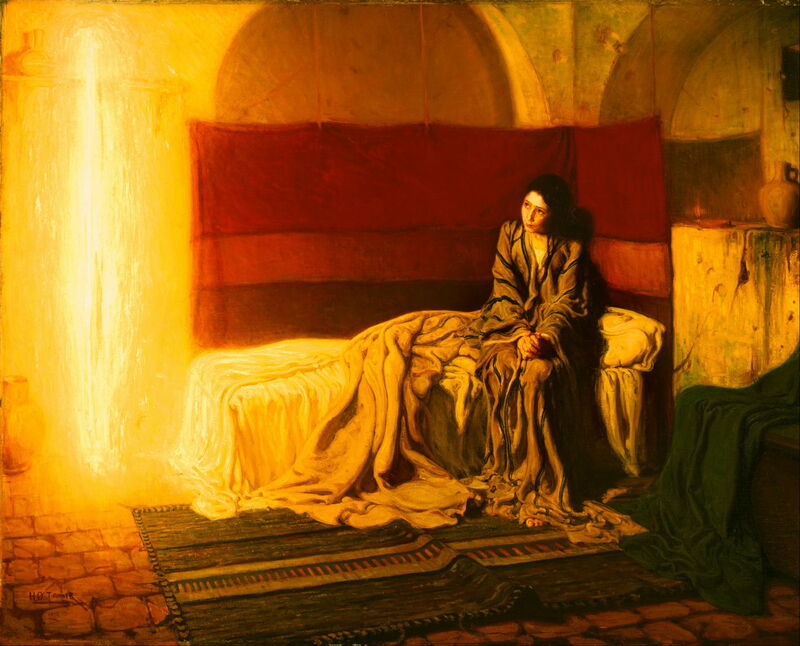 The Annunciation (1898) is one of the American Henry Ossawa Tanner’s most unconventional paintings of a traditional event. The scene is, like Rossetti’s, set in the private space of Mary’s bedroom, the bedclothes rumpled untidily, and Mary in very casual night dress. There is no angel, as such, but a dazzling fire of the spirit, which makes a subtle crucifix with a shelf behind. This painting was accepted for the Salon of 1898, and became a popular reproduction in magazines. Contrast those very modern approaches with that of John William Waterhouse, in the dying embers of the Pre-Raphaelite movement, and the year in which the First World War started. Strictly speaking, those paintings should refer to the Annunciation to the Blessed Virgin Mary. The other, and more timely, annunciation with which I will close was that to the shepherds of the Nativity, a theme for two modern and contrasting works. 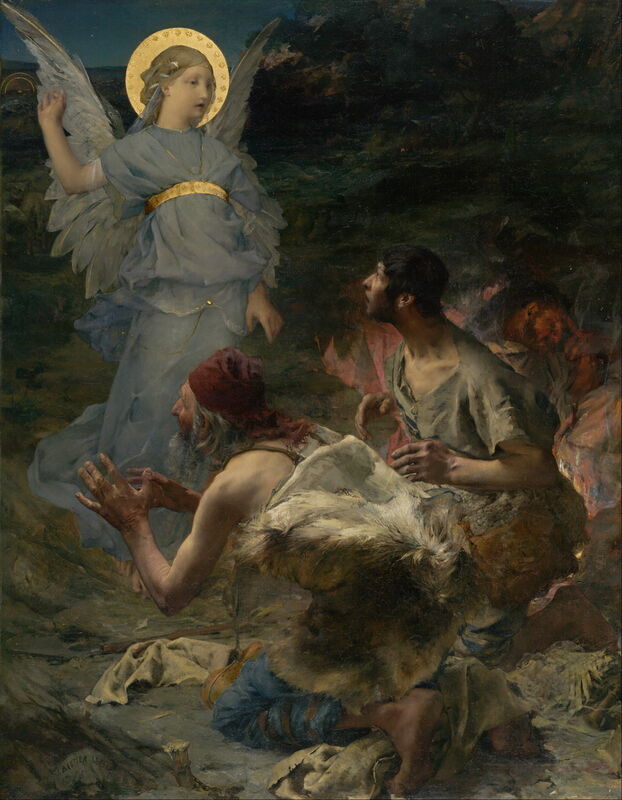 Jules Bastien-Lepage’s submission for the final phase of the Prix de Rome competition in 1875 was The Annunciation to the Shepherds, prescribed as ‘the annunciation of the nativity of Christ by the angel to the shepherds of Bethlehem’, as in the Gospel of Luke, chapter 2, verses 8-15. This might serve as his painted manifesto, building on tradition rather than discarding it. It strikes compromise between the gilding and Renaissance appearance of the angel, the rural realism of the shepherds who have come from Millet rather than Bethlehem, and the wonderfully controlled looseness and gesture of the darkened landscape. He wastes not a brushstroke in telling its simple story, in the almost averted facial expressions, the arms frozen in surprise, hands which have just been tending sheep, even their bare and filthy feet. Although awarded a consolation prize, he did not win the competition, and retreated to his village, finding his consolation in the pursuit of truth in painting. 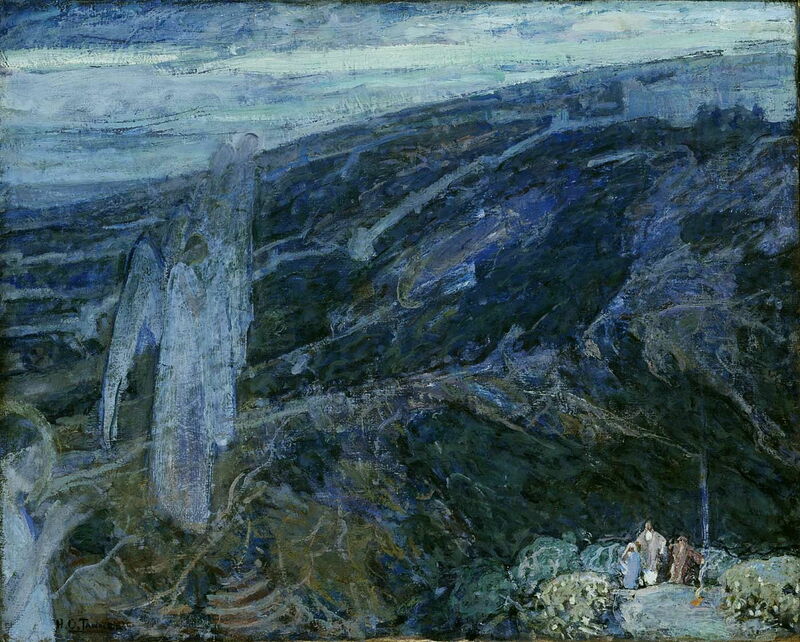 Tanner’s Angels Appearing before the Shepherds (c 1910) took his mixture of loose brushstrokes, rubbings, and scumbled passages close to Symbolism. Its colours are closely limited, with a single small patch of orange at the lower right, indicating a small open fire, amid an abundance of blues and a few greens. The angels at the left are so ethereal that they could at any moment dissipate like a puff of smoke, and the three shepherds are almost insignificant by comparison. Religious set-pieces like the Annunciation are not boring or repetitious when in the hands, and brushes, of great artists. Posted in General, Life, Painting and tagged annunciation, Bartolomeo, Bastien-Lepage, El Greco, Fontana, Lorenzetti, Memling, Murillo, narrative, painting, Rossetti, Tanner, van de Velde, van Eyck, Waterhouse. Bookmark the permalink. This is a lovely Christmas gift to us, Howard. Delightful. Thank you. And once again, Merry Christmas to you. Thank you, Kitsy – and Merry Christmas to you too.